Make some cash on the side while spreading the word about Edit911’s editing services! 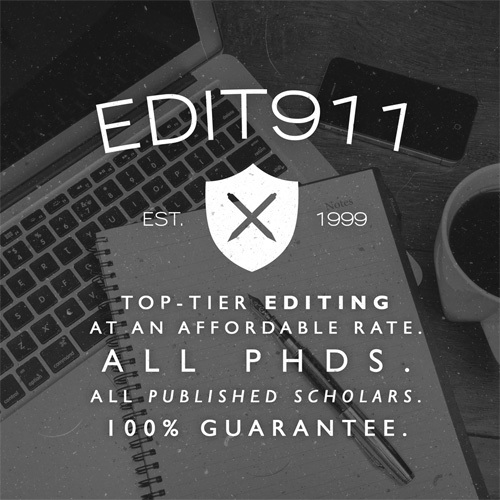 All you have to do is tell your friends and colleagues about Edit911, and we’ll give you a 10% commission—which can be a nice chunk of change on large jobs such as dissertations and books! Your commitment level is completely up to you. If you’d like to generate multiple leads to us, contact us and we’ll give you a discount code to give to your referrals and they’ll even get 5% off. If you want to go all out, we can provide you with business cards, flyers, t-shirts or other promotional materials. Sign up for our automatic online referral program and get your unique tracking link by clicking the ‘Refer a friend now’ button at the bottom right of this page, or by clicking here. Want to endorse our service on your website, blog or social media profile? Please use the banners/link code below. *Larger and custom banners available upon request. Please contact us via the contact page. Want to become a representative of Edit911 on your college campus or in your real-world sphere of influence (your company, events you attend, etc)? We can provide you with business cards, flyers and beautiful, professional handouts with a unique coupon code so you can both offer a discount incentive AND receive a 10% referral commission from all sales you generate. Sounds pretty good, right? Simply contact us via the contact page or our toll-free phone line (1-877-EDIT-911) to setup your coupon code, and download the print materials below. Alternatively, we can have the print materials produced and sent to you if that is preferable to you. Just specify the amount you would like and your address when you contact us. The business cards are designed with an empty space to put your unique coupon code. It’s recommended that you either write it in neatly with a sharpie or get a stamp made with the code to stamp each one. Use them as you would your own business card – in face-to-face interaction where the potential client wants an easy way to save the information you’ve given them about Edit911 and the coupon information. The 2-sided postcard size flyer is designed to either be a face-to-face marketing tool that provides a bit more information and selling points than the business card, but is also good for non face-to-face interaction, like leaving on countertops in strategic places (a graduate student lounge, for instance) or at a booth at a conference, in a swag bag, pinned to a cork board, etc. It’s meant to be printed on matte card stock so it’s nice and durable and high-quality. This isn’t what you’d use to tape to walls or put on windshields or hand out to the masses where it has a high probability of being thrown away – that’s the last print file, below – the 1 sided standard flyer. This is the cheapest and easiest of all the print marketing options. This is the standard, 1-sided computer paper sized flyer that is easy to print (you can just run some off on your home printer or at a FedEx) in either color or black and white. Since it’s super cheap and easy to produce you can use this one to tape to doors & walls & light posts, cover pin boards, hand out to random people whilst shouting at them, dump from the sky like rain – etc. It also has a place for your unique code so I’d be easiest to add it in an image editor before printing OR write it on one, scan that and print the scanned one.